Fri., April. 12, 2019, 8 p.m. 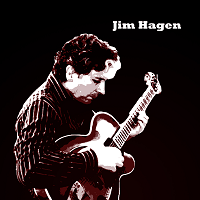 The new Jim Hagen album, Jazzical, is now available! Listen to sample tracks "Jazzical" and "Pismo Beach" at AllAboutJazz! ​Buy it at CD Baby, iTunes or Amazon! Jim's debut album is still available at CD Baby, iTunes and Amazon! redefine it for the artist’s own personal use." the finest jazz musicians writing and recording today." Hear the new single "Pismo Beach" at your local Panera Bread!